I should begin by explaining the title of my review. Historically, great female opera singers are sometimes given specific endearing nicknames by their fans: for example, the legendary Maria Callas was known as La Divina, while the magnificent Joan Sutherland was La Stupenda to her legion of admirers. 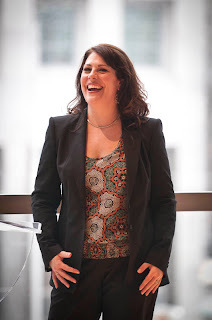 Fans of soprano Sondra Radvanovsky have dubbed her affectionately as "La Rad" - short for her last name, but I dare say also for her radiant vocalism. Well, "La Rad" today gave a truly stunning recital of operatic arias at the Richard Bradshaw Amphitheatre. Simply put, "La Rad" is simply "La Fab" for "the fabulous" or more correctly in Italian, La favolosa. Opera aficionados have long considered her to be the premiere Verdi soprano of our time. Her Verdi roles have included Violetta, Elena, Trovatore Leonora, Elvira, Lina, Luisa Miller, Elisabetta, and most recently Amelia and Aida, with most of these still in her active repertoire. Sondra Radvanovsky's dark-hued, luscious and silvery timbre is ideally suited to these most exacting of Verdi heroines. Not only is the voice beautiful, it's also the largest in front of the public today - at least I haven't encountered any major singer with her volume since the heyday of Regine Crespin and Gwyneth Jones. 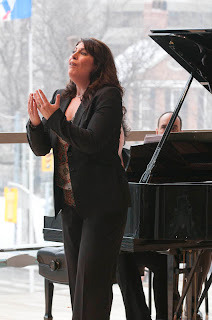 But Radvanovsky never uses volume for its own sake, as she possesses an amazing technique which allows her to fine the voice down to the softest pianissimos and a long breath-line that recall Spanish diva Montserrat Caballe in her prime. Those lucky enough to get into the recital today were treated to a stunning vocal display not heard in these quarters in a very long time. With COC Ensemble head Liz Upchurch offering solid support at the piano, Radvanovsky designed a program with arias that have special meaning to her. It began with the perennial chestnut 'O mio babbino caro' from Gianni Schicchi, a piece with which the soprano won her first voice competition at the age of 16. 'Vissi d'arte' followed, sung with refulgent tone and exemplary legato. 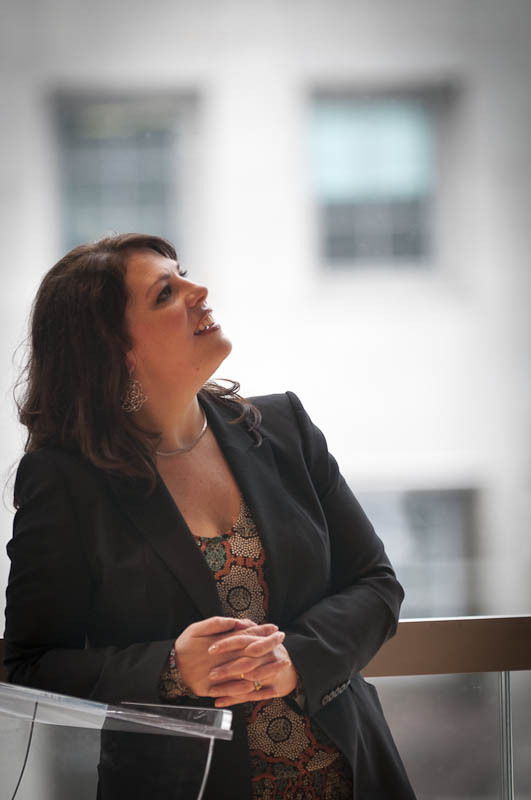 She sang Tosca for the first time recently and will reprise the role at the Met in January. Then it was her calling card - Leonora's great 'D'amor sull'ali rosee' from Il Trovatore. Her soft singing and long breath line were nothing short of amazing in this piece - it makes one really look forward to her Met in HD appearance in this role later in the season. Amelia is her newest Verdi role, which she has just sung at the Chicago Lyric. Her 'Ecco l'orrido campo' and 'Ma dall'arido stelo divulsa' were full of dramatic urgency and pathos. The recital concluded with 'Senza mamma' which ended in the most remarkable fil di voce one ever hopes to hear. The concert was followed by a Q & A in which Radvanovsky fielded questions from the enthusiastic audience with humour and grace. The hour concluded with a standing ovation followed by an autograph signing session. Married to Canadian Duncan Lear, Ms. Radvanovsky has called southern Ontario home for the better part of a decade, so it was unfortunate it has taken such a long time for this exceptional artist to appear with the COC. Let's hope COC Intendant Alexander Neef will make up for lost time by bringing this exceptional singer back at the earliest possible opportunity.